Reel Gems – Testing Your Luck with a Touch of Glamour - Top Rated Online Casinos shows you the Best Online Casinos! Published on April 9, 2013,	in Casino Games. Reel Gems video slot lets you bask in visual luxury of jewels, with sparkly Diamonds, Emeralds, Rubies, Sapphires and Opals that weave the dreams of riches and beauty. Reel Gems brings you an irresistible, innovative RESPIN feature. After each spin, you can pay to re-spin individual reels, increasing your chances to get a winning combination. Getting the right collection of gems can be challenging, but pays well – especially if those gems are Diamonds, the highest paying gem in the game. Also, the Reel Gems logo symbol will work as a Wild substitute. It is very important to note that Reel Gems is a 5-reel, No Payline video slot, with 243 ways to win. Ideal for experienced players, Reel Gems allows a bet of maximum 250 coins. At a base game, the top prize reaches 40 000.00, which can become tripled if won during a Free Spin bonus round. 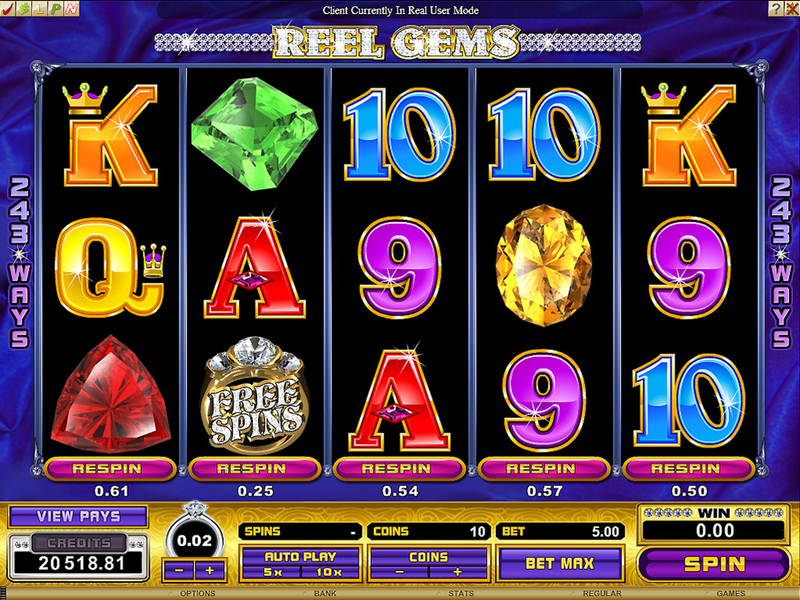 15 retriggering Free Spins can be activated by getting 3 or more Diamond Ring Scatter symbols on the reels. Here, it’s not about the size of that diamond ring, but about how many of them you get! Since everything is tripled during Free Spins, playing these bonuses gives you better chances to win big. Elegant in its visual simplicity and adorned with the exciting Respin feature, Reel Gems will offer perfect entertainment for players who want a video slot that presents them with an additional challenge. Keep those gems spinning, and who knows, maybe soon you won’t be seeing them only on screen!